Vicki has ramped up It's A Man's Table Too! with her Bourbon Apple Glazed Wings, Sticky Honey Chicken Wings, (These are not your grandmother's) Party Pretzels, & Beef Chili with Toasted Cumin Crema. Heat 2 Tbsp oil in large Dutch oven over high heat. Sprinkle beef chunks with salt and pepper, add 1/3 to pan, sauce until browned on all sides. Repeat 2 more times with oil and meat. Return all beef to pan, sprinkle with cumin and stir well. De-glaze pan with beer and bring to boil. Cook until beer is almost completely reduced. Remove meat from pan and set aside. In same pan, add remaining 1 Tbsp oil and add onions, cooking until soft. Add garlic and cook about 2 more minutes. Add the peppers, cooking until soft, about 4-5 minutes. Add the chipotle pepper puree, and spices, cooking 2 minutes. Add the chicken stock, pureed tomatoes and reserved tomato juice and bring to boil, about 15 - 20 minutes, cooking until thickened. Add beef back to the pan, reduce heat to medium, cover, and simmer until chili is thick and the beef is tender, about 90 minutes. If needed, continue simmer until thickened. With potato masher, smash beef until most chunks are shredded. Add beans, simmer 5 minutes. Remove from heat, add chocolate and maple syrup, stirring until melted and combined. Adjust seasonings, if needed. Over medium heat, saute cumin seeds in small pan, toasting until lightly golden brown. Place in small bowl and stir in crème fraîche, season with salt and pepper. 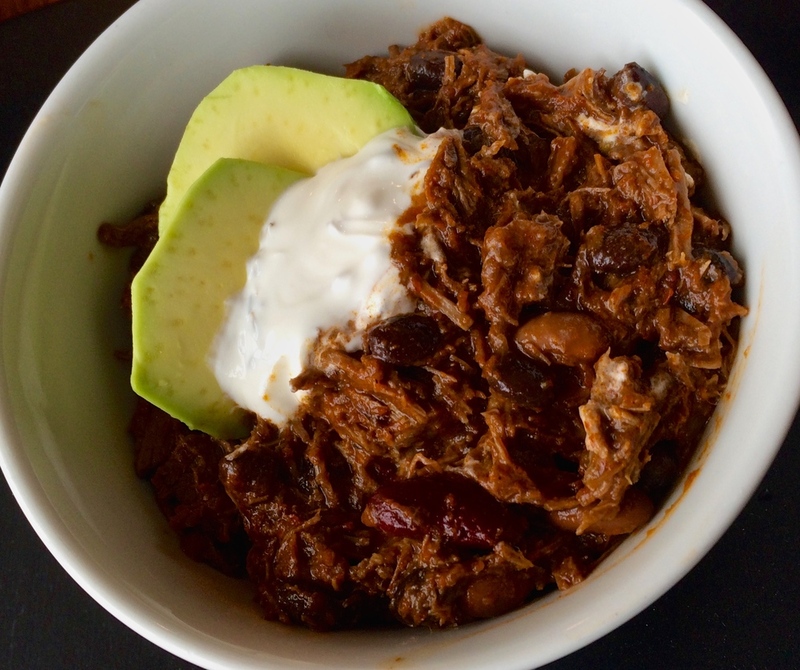 Serve chili with a dollop of creme and optional slices of avocado.